Lined up at the Riverwalk Center like marble outside the quarry at Carrara, the 15 blocks of snow stand ready for the beginning of the annual International Snow Sculpture Competition, today. About 12 feet tall, 10 feet long and wide, the blocks give sculptors the opportunity to make something big, with a lot less effort than carving marble. Fifteen teams have arrived to make sculpture. This morning, each team selected a block and attempted to claim it in the shotgun start at 11 a.m. Although the snow looks very similar at this point, like stone, each block has different qualities depending on the composition and the temperature of the layers as it was being formed. Breckenridge uses only man-made snow, so there are very few impurities. But ice chunks and badly compacted areas can occur. And like stone, some are on the inside, and can’t be seen until a sculptor gets to them. So, each team makes its best guess from the exposed surface. A stone carver doesn’t have to consider exposure, but snow sculptors do. Picking a block that is protected from wind, or will get the least sun, is particularly important if the design has many thin or delicate sections. But the team will also consider which site will best show off the finished piece to the audience and judges. The final presentation is also a concern after each team has claimed a block. Before any of the four team members start cutting away the block, experienced sculptors will consider the orientation of their concept inside the four walls that face them. Once that’s decided, the heavy work begins. Removing snow is what the first day is all about. And the second day, too. By the end of Wednesday, the blocks will look very different from one another, but they probably won’t look like much. On Saturday, when finished sculptures stand where blocks were, it will be hard to remember how rough they looked. 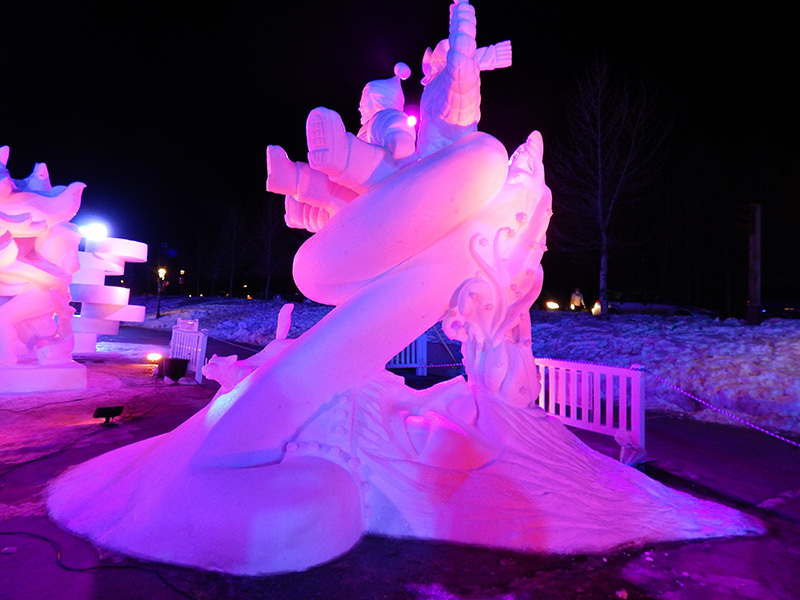 When all the snow was moved away, the sculptures that remained were judged by a panel of experts. And this years gold medal went to Team Breck.